Eighteen-year old Mary Therese Tabadarepresents Barangay Suba won the Binibining Talibon crown which signaled the start of her year-long reign as the town’s ambassadress of goodwill, besting 18 other candidates in the pageant’s coronation night. A jam-packed Pres. CPG Multipurpose Center stood witness to the historic crowning held on Wednesday evening, May 23. 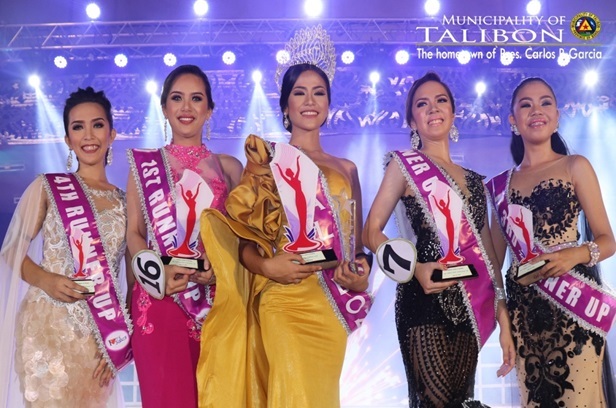 Aside from winning the night’s top plum, Tabada hauled minor and major awards – including Best in interview, Evening Gown and Production Outfit. Adjudged as 1st runner up was Charmaine Garcia of Barangay Sikatuna while Hanna Antique of Barangay Poblacion took home the 2nd runner-up. Other winners include Tanghaligue’s Mary NhelDajao (3rdrunner up), and Burgos’ Jeanne Van Allen Valle (4th runner up). The local government unit of Talibon partnered with Liga ng mga Barangay Talibon Chapter and Talibon Union of Artist in staging the search for the town’s official muse, Binibining Talibon 2018 beauty pageant was one of the activities in the 188th Annual Town Fiesta Celebration of the Municipality of Talibon. It was hosted by VergelZarel Boyles and Esteban Carosus.